Hello and welcome to an NZADDs update — this year’s budget special. The following analysis of the New Zealand budget, and what it meant for aid, was posted on the Development Policy Centre’s blog this morning. You can read the blog post, tweet it, offer your comments, and beg to disagree via the original blog post. 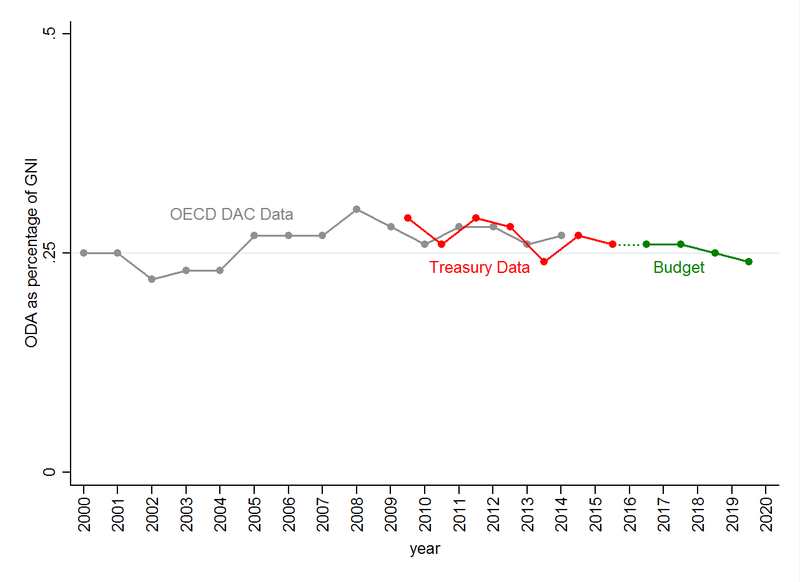 Also, if you’re interested in what happened to Australian aid in the Australian aid budget this year, the Devpolicy blog has a suite of blog posts as well as a recorded seminar which will tell you everything you need to know. Watch and read here. There was a time when I thought having Murray McCully as a foreign minister was the worst possible thing that could happen to an aid programme. I was wrong. Sure, he reintegrated the New Zealand government aid programme into MFAT without being able to explain convincingly why this was necessary. And sure, he has been openly disparaging of development expertise while at the same time unwilling to recognise the complexities of aid work. But at least the reintegration he presided over left much of the aid programme intact, working as a coherent group within MFAT, something that contrasts favourably with the disintegration of AusAID. What’s more, over time New Zealand aid programme staff have found a way to work with the minister to ensure that despite some glaring issues with specific aid undertakings, some of the better aspects of New Zealand aid have been preserved. And, in terms of aid volume, Minister McCully’s tenure has seen nothing as disastrous as Australia’s aid nosedive. 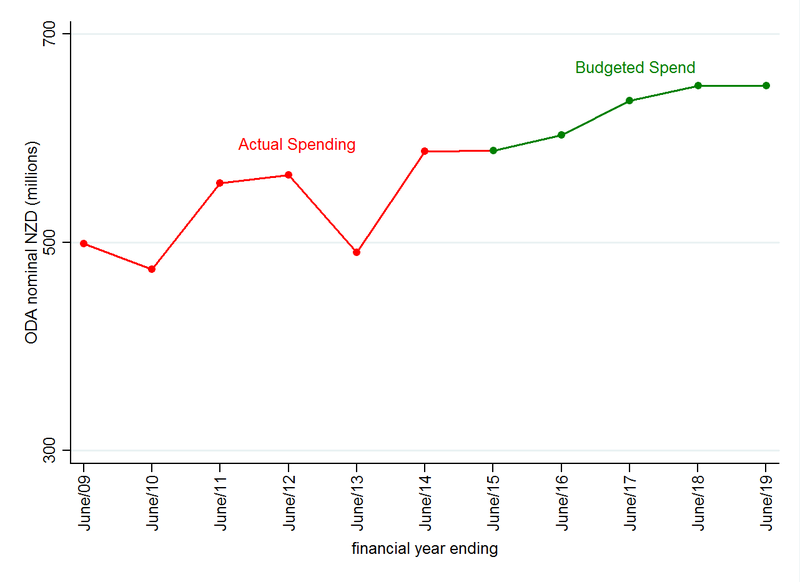 Indeed, the budget for New Zealand’s 2015/2016 financial year was a comparatively generous one for aid, as can be seen in the chart below: in nominal terms aid went up, and it is set to increase somewhat in future years too. (Data, and data sources for all the following charts can be found here). This is good news. Or, at least, comparatively good news. Up is better than down. 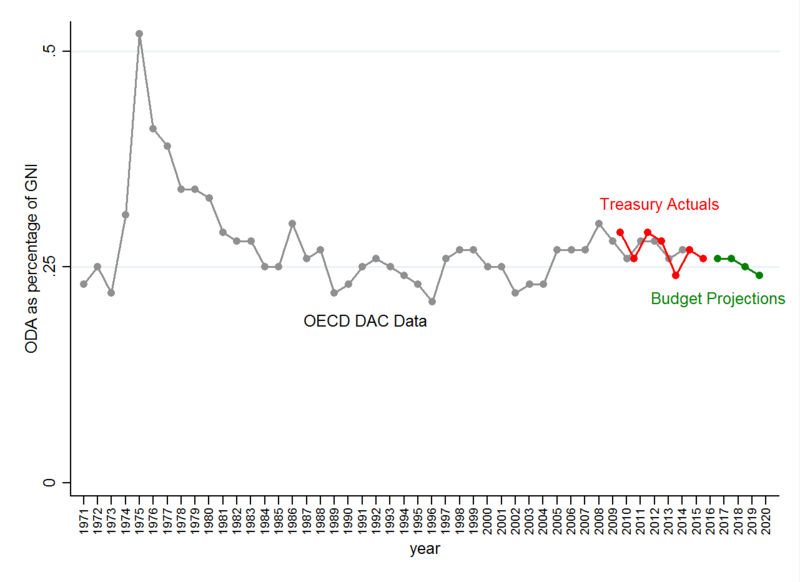 Particularly given that — like Australia — New Zealand has been running a budget deficit for a number of years. At least New Zealand’s National Party government has resisted the impulse to cut aid while making spurious claims about balancing the books (spurious because aid is too small a share of government spending to have a material impact on the state of any donor’s fiscal health). But before we Kiwis start celebrating like we’ve made the finals of the Cricket World Cup, there is some not-so-good news to ponder. 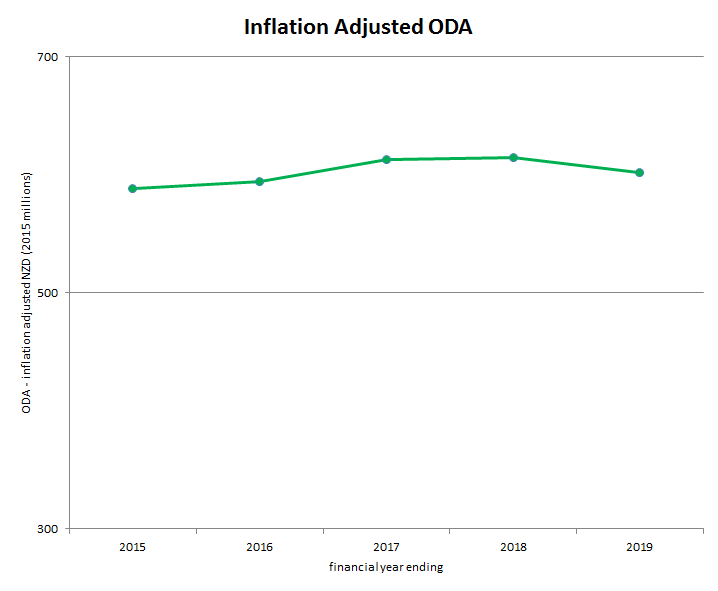 First up, once projected inflation is taken into account, as can be seen in the following chart, the budgeted increases in ODA are actually very modest, and there’s even a post-inflation decrease budgeted for the 2019 financial year. The news gets worse when aid quality is brought into the picture. As I touched upon above, one of the biggest issues with New Zealand aid in recent years is that an increasing share of our ODA has been used to advance New Zealand’s economic interests rather than to help promote development in recipient countries. New Zealand ODA has funded dubious dairy initiatives as well as projects that appear to be foremost about fostering ties between New Zealand businesses and their counterparts in South East Asia. In the case of the 2015/16 budget, a careful read of the accompanying documentation suggests (on page 8) that much of the coming increase in New Zealand aid will be directed to “thematic areas such as agriculture, renewable energy and information and communications technology (ICT).” This isn’t a problem in the sense that there is anything wrong with agriculture, or renewable energy, or ICT, but it does suggest a supply-driven approach to aid, in which New Zealand focuses less on what’s needed and more on areas where we think we have business strengths. (Why, for example, are we giving aid to develop geothermal power in Saint Lucia?) Such a supply-driven approach to aid is worrying, not only because it brings the risk of more aid being given to help ourselves in the first instance, but also because development is context specific, and aid driven by what donors want to give rather than what is actually needed frequently brings white elephants in its wake. New Zealand’s 2015/16 aid budget isn’t all bad. An increase is better than a cut, and some unambiguously worthy areas such as humanitarian aid are being boosted. And it is clear from work on New Zealand’s soon to be released aid strategy that there is still some concern for good aid practice within the aid programme. But New Zealand remains a long way short of being able to feel proud of its contribution to international development.